Foreground: Flower Matango (d), 2009 Oil paint, acrylic, fiberglass and iron. 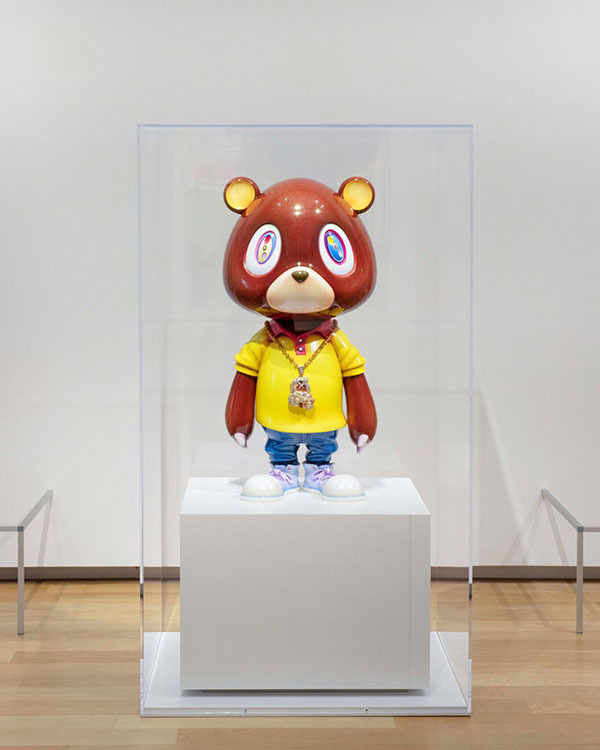 Kanye West, sneakerheads and fine art curators love Takashi Murakami, but the prolific Japanese contemporary artist is more than the smiling flowers and brightly colored graphics that have made him an international brand. 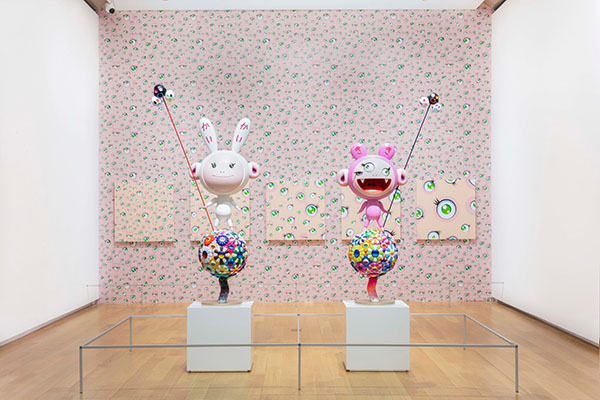 Takashi Murakami: The Octopus Eats Its Own Leg, the retrospective exhibition at the Modern Art Museum of Fort Worth now on view through Sept. 16, reveals the artist's development over three decades. Takashi Murakami speaking at The Modern Art Museum of Fort Worth to open his exhibit. 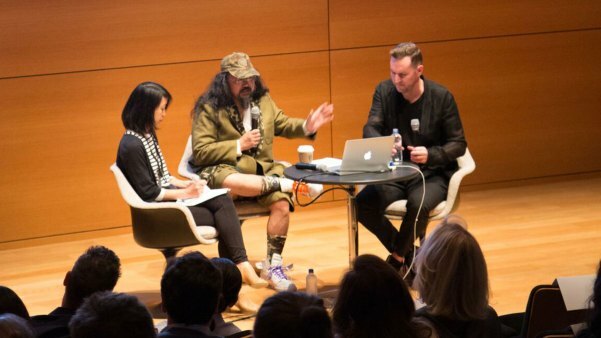 In a conversation with Michael Darling, the Museum of Contemporary Art Chicago which organized this exhibition, Murakami spoke about his creative process and priorities during previews of the exhibition. He admits he hesitated to include some of his earliest mature works of turtles, fish and other animals, but those paintings reflect the Nihonga style of painting he earned his PhD in from the Tokyo University of the Arts in 1993. He recalled the coincidental nature of his color palette at the time: he didn't have enough money to purchase a variety of pigments. "I really had a limited color palette to work with and I was always trying to experiment with how to expand the colors I use," Murakami said through his translator, Yuko Burtless. Murakami is sensitive to the mood of a moment and that is reflected in his work. As he prepared for an exhibition in New York in 2007, he contemplated the events of 9/11 and the ensuing wars in Afghanistan and Iraq. "Around the time of this show, I thought it was really difficult for me to come up with the right themes and motifs, because since 9/11, the New York art scene felt muddled and it has lost its clear themes and direction. It used to be so gorgeous, but it lost its sheen and felt dull," Murakami said. He used it as an opportunity to explore themes of war, a taboo subject in Japan. Recently, his work reflects the impact of the 2011 tsunami and earthquake that hit Japan, adding a more macabre quality to his paintings. Kaikai Kiki, 2005 Oil, acrylic, synthetic resins, fiberglass and inox, in two parts. Jellyfish Eyes, Acrylic on canvas. Mememe, 2002 Hand silk-screened vinyl wallpaper. Murakami is best known for his blurring of high and low art, fusing Eastern and Western cultures and embracing ancient and modern techniques. "Superflat" is his signature style, combining Japanese painting techniques with anime-inspired themes and characters within a flattened picture plane. Commercialism and pop iconography is rendered through the lens of traditional Japanese painting craftsmanship. His most famous character, Mr. DOB, looks slightly like Mickey Mouse and acts as Murakami's brand and alter-ego. When he first introduced the character, he didn't get the response he expected. "After I presented that character for the first time in my shows, maybe for about 6 years, it didn't have any good reaction from United States audiences," Murakami said. 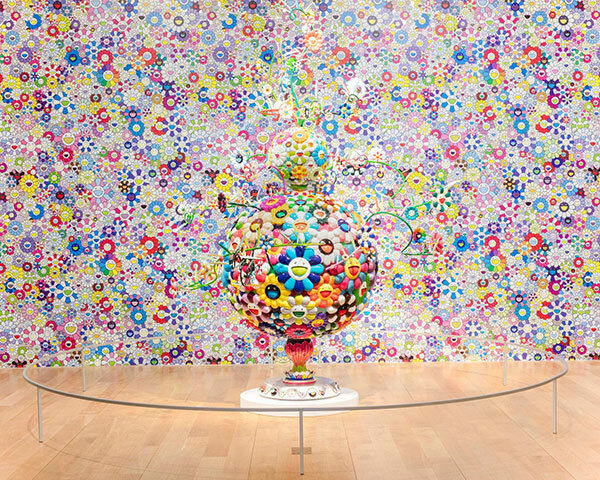 When Murakami began translating paintings into sculptures, he was not satisfied with the results. Initially, he worked with professional fabricators, but they did not understand his intention to create shiny, flat sculptures. "The characteristic of my sculptures is that perhaps for the professional sculptors, my work would look superficial, shallow and kind of flat," Murakami said, explaining the development of higher quality 3-D printers was a breakthrough for his work. "It's possible to make my 2-D flat drawings and print them out into a relief. Now I'm able to make my 2-D images into 3-D sculptures, and that's what I've been wanting to do. I was trying to prove my superflat theory, even in the sculpture." Kanye Bear, 2009 Aluminum, carbon fiber, urethane paint, steel, and Corian base. MTV inspired Murakami to branch out into multiple mediums. 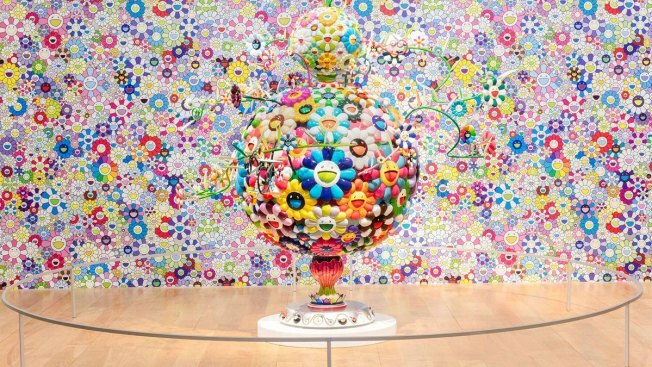 "I thought it was a given that an artist has to be able to do multiple things and wear multiple hats just like the MTV-era musicians," Murakami said. In addition to collaborating with Kanye West, Pharrell Williams and Louis Vuitton, he has started creating films with sci-fi inspirations. "At the root of my creative motivation is the influence of sci-fi in my youth," Murakami said. "I've been working on exploring what those essences are, putting them in my films and then circling back and feeding them into my paintings and sculptures." At age 56, Murakami reaches his youthful fans through social media, specifically Instagram. "I'm so bad at photography, but in Instagram, you can fiddle with composition and change colors and effects. Even if you're bad, you can post great pictures," Murakami said. He spends about two hours a day on Instagram and often posts what he is working on, tests ideas and gauges reaction. Foreground: Flower Matango (d), 2009 - Oil paint, acrylic, fiberglass and iron. Murakami embraces whatever opportunities arise and uses them to evolve his work for a modern culture. "There is no strategy involved in this. It's just my life," Murakami said. "I go along with the flow."